Road distance is calculated as the fastest route, not necessarily the shortest.. 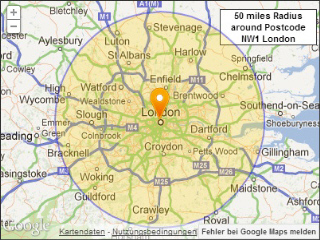 "...Your PHP Script to calculate the distances between postcodes has simply impressed us with its easy configuration and user-friendly features. And it not only calculates the distances as the crow flies but also the road distance. Amazing! Thank you for all the effort you have made to develop such a great product for us..."
"...Since we have implemented your distance between postcode feature in our event portal, we have gained great customer response from that. Our viewers can now easily locate the events in their vicinity. Ver friendly and quick customer support. Thanks for everything..."
"...The service and the quality of your ASP.NET Script has benefited us in many ways when we implemented in our site. This is really an amazing add-on to our web application. 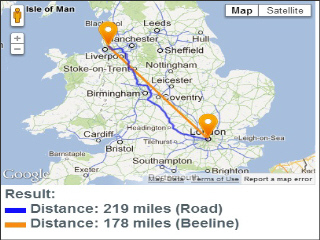 Extra thanks for the visualisation of the distance and route using the map script. Now we certainly have the most sophisticated search functionality in our real estate portal..."